If I slept poorly the night prior to my check ride, the night following the ride was even worse. Exhausted, I dragged myself into work the next morning. A headache throbbed obstinately in my temple all day as my brain enacted a sit-down strike in protest of inadequate rest. Tom called mid morning in full blown coach mode. "I just talked to Ken. He said you're an excellent pilot, your knowledge is good, and that you fly your airplane very well. He said your VOR approach into Le Roy was flawless, even while partial panel. You need to get right back on the horse and finish this up. Ken offered to fly with you tomorrow night to knock out those last two approaches. If we fly tonight, I will sign you off to take the test tomorrow and we'll have to submit a new application through IACRA. If we do that, you can call Ken in the morning and he'll meet with you tomorrow afternoon to wrap things up." My head throbbed as I contemplated this. I was exhausted and knew from prior experience that flying without adequate rest was rarely worthwhile or confidence inspiring. But I appreciated the encouragement I was receiving from Tom and Ken. Also, Tom was right. I needed to get back on the horse and so I agreed to meet him at Le Roy that night. En route to Le Roy, the Warrior bucked and shuddered in rough, clear air. The visibility was unlimited, but the winds were variable and I noticed my wind correction angle varying continuously since departing Williamson. I called five miles out from Le Roy and advised that I would overfly the airport to peek at the windsock. This was answered by another aircraft orbiting nearby. "We just flew over the field, but could not see the sock." "We just installed a new one, it should be down there," I responded. It was funny how easily I slipped back into "we" when talking about my home of the previous seven years. The other aircraft abandoned its search for the windsock and simply chose to enter downwind for runway 10. Not wanting to fly against this traffic, I also entered downwind for 10 behind him. From the pattern, I could see the windsock and it was clear to me that the wind favored runway 28. I shared this with my new friend and we both transitioned to a runway 28 pattern. While I was flying the base leg of the pattern, I provided the visitor with progressive taxi instructions to get where he needed to go on the ground. I landed smoothly in less crosswind than I expected and taxied to the fuel pump. "Hey Cherokee," called the other pilot on the radio, "where's the fuel pump?" "I'm parked right in front of it," I responded. "Boy, that's some crosswind we had on final, huh?" After I fueled Warrior 481, the other aircraft taxied over and took on fuel. The pilot was concerned that he did not have a Detroit sectional chart (which is where Le Roy and Rochester are charted), so I gave him one of mine. He eventually departed, pleased with his experience at the Le Roy Airport. The experience bolstered my damaged confidence in myself as an aviator. Tom arrived right on time and we talked through what had happened on my check ride the previous evening. He understood the logic that led to my Great Brain Fart O' Failure, but also made sure that I understood why it was wrong (believe me, I got it). Then we flew both approaches at Rochester from the previous night and I received a fresh check ride endorsement in my logbook. I returned home around 10:00 pm, filled out a new IACRA application, and text-messaged Tom that it was ready for his approval. Just before 11:00, Tom responded that the he had signed the application and gave me marching orders to call Ken first thing in the morning. I went to bed and proceeded to not sleep until sometime after 2:00 am. I can only assume that Tom sent these messages in an order adhering to established English syntax and that they were scrambled somehow by the phone, but who knows? Ken answered his phone immediately when I called him at 8:30. I opened with, "I hope this is a civilized hour to call..." Ken chuckled and affirmed that it was. We made plans to meet at four o' clock that afternoon. I was back at the Rochester Air Center, having let down through turbulent air. Wind was gusting from the northeast at 10 to 19 knots. Conditions were certainly rougher than they had been on Tuesday. In counterpoint to the turbulent atmosphere, I was finally calm inside. And this is how the experience of earning my instrument rating reminded me of graduate school. In the final weeks leading to my dissertation defense, I worked twenty hour days, seven days a week. As I adjusted to that lifestyle, I found myself in a curious zone of frosty mental acuity fueled by a significant amount of anxiety and determination that countered a very lean mixture of sleep. I realized that I felt much the same way as I waited for Ken. And so it was that when Ken entered the lobby, I knew that I was ready for him. Because the wind was out of the northeast, we decided that we would fly the RNAV runway 7 and the ILS runway 4 approaches. 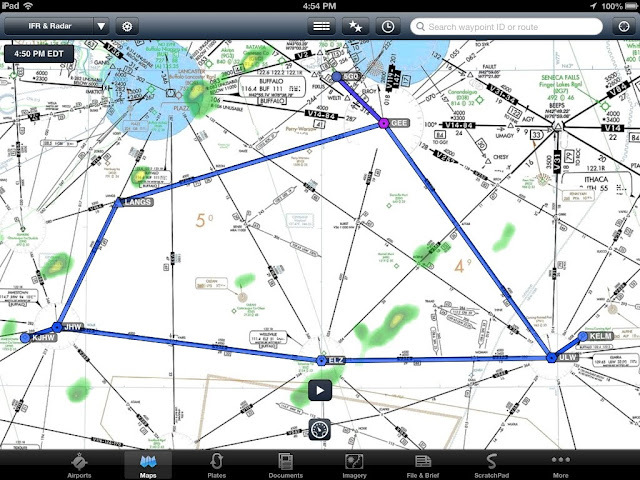 I had prior experience with the ILS, but had never flown the RNAV 7 before. Aloft, the Warrior was buffeted by both wind gusts and thermals, but I held my course and altitude like a pro. The RNAV 7 approach was flown as near to perfect as I could have ever hoped to have flown it. After the low approach to runway 7, we were vectored around for the ILS approach to runway 4. I briefed the approach plate and set up my instruments, talking through what I planned to use as primary means for identifying fixes and what I was putting into place as a back-up. Heck, I even remembered the timer. During this time, my right eye began to itch and burn. Initially, I forced it to stay open and tears rolled down my right cheek to an extent that Ken noticed them. I closed my right eye in an effort to soothe it, grateful that my gaze was inside the cockpit where depth perception was not needed. Soon enough, we were established on the ILS for runway 4. "Stay under the hood until we reach 200' above the threshold," Ken reminded. "Warrior 481, we have a turbojet aircraft on final for runway 4 behind you. Break off your approach and circle to land runway 7." I glanced at the circling minimums shown on the approach plate and noted that we were 100' above them. I sidestepped the runway 4 approach course and arrested the airplane's descent at the circling minimum descent altitude. At that point, Ken had me remove the Foggles and complete the landing on runway 7. Someone had obviously greased that runway before our arrival; it was the smoothest landing I had made in weeks. "Really good," Ken commented, momentarily breaking from his stoic examiner's demeanor. Taxiing back to the 300 ramp, my cheek still damp from an aggrieved eye, I noted to Ken that I had my right eye closed for much of the ILS approach. He smiled, "did it with one eye tied behind your back, eh?" Once the prop shuddered to a stop and the landing checklist was complete, Ken asked, "the trip you want to take this weekend, that's in this airplane?" When I acknowledged that it was, he extended his hand, "well then, you'll be able to do it as an instrument rated pilot." Back inside Rochester Air Center, we completed the paperwork. Ken defaced my current pilot certificate and handed me a new temporary certificate while delivering the apparently mandatory decree that it was a license to learn. I was grateful to both Ken and Tom for their support and encouragement to get right back on the horse after the brain fart that derailed my check ride two days earlier. I was also happy with myself that, after Tuesday's experience, I came back and flew those approaches not just competently, but truly to the best of my ability. Afterward, Ken and I sat and talked for over an hour, swapping flying stories. I could not have asked for a better way to detox from my self-induced stress of the past week. Friday night and Saturday morning, I pored over weather forecasts between Rochester, NY and Knoxville, TN in preparation for our vacation. Marginal VFR was expected, with 3000' foot ceilings forecast that would present relatively easy approaches for a newly minted instrument pilot. But the likelihood of thunderstorms ahead of an advancing cold front in addition to strong headwinds that would place us in the clouds for nearly six hours (versus a typical 4.5 hour en route time) reduced my enthusiasm for making the trip in the Warrior. When combined with a week of poor rest, I decided that it was not a good day to fly to Tennessee with Kristy and The Bear on board. "That's OK, Daddy, we can fly in the clouds some other time," assured The Bear. And so I did take the trip to Knoxville as an instrument rated pilot. I just did it in the Honda instead of the Piper. Technology and aviation prowess aside, making good decisions is ultimately what instrument flying is all about. I have heard it said that pursuing an instrument rating is akin to graduate school for aviators. I can say with some certainty that, at the end of the process, I felt much as I did after defending my doctorate in chemistry, though maybe not for the reasons that might be expected. I counted the passage of time with each thump of an anxious heart as I waited in the Rochester Air Center's unfamiliar lobby for the examiner who would assess my petition to join the fraternity of cloud busters. Intellectually, I was ready. I had the knowledge, could fly the airplane, and it was Tom's expert opinion that the rating was easily within my reach. However, in the previous two days, both scheduled instrument practice sessions with Darrell were undone by weather, first by a 2000' scattered layer that prevented flying practice approaches while VFR and then by a line of thunderstorms that threatened to overrun Le Roy. I was prepared for the check ride, but not emotionally ready for it. Anxiety-induced lack of sleep detracted even further from my confidence. 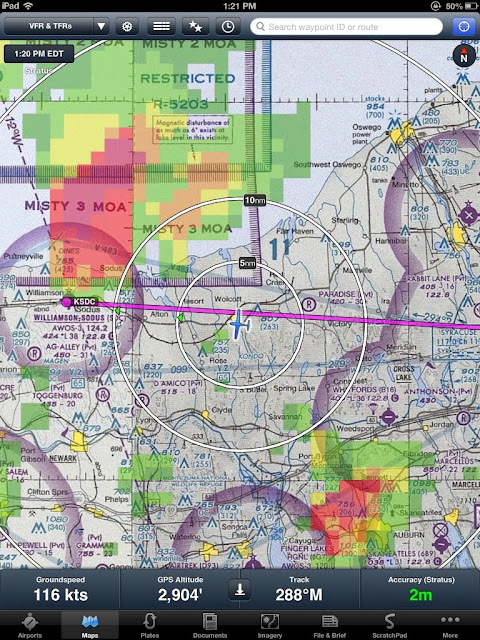 Despite the nerves and uncertainty, I wanted to complete the check ride before a July 27 flying trip with the family to Tennessee, where expanded weather capability had the potential to reduce the risk of being stranded. Obviously, I was only interested in a slight expansion of my weather envelope; approaches down to minimums with the family on board as a low time instrument pilot do not fall into the "good idea" category for me at this time. Ken arrived punctually, shook my hand politely, and we dove into "paperwork". Since my first check ride in 2002, the portion of that paperwork actually involving paper was largely eliminated in favor of the FAA's clunky IACRA (Integrated Airman Certification and Rating Application) website. Though I had meticulously organized the information that Ken would want to see (like marking important logbook pages with Post-It notes), I did not come prepared with my IACRA password. "I'm going to phone a friend," I told Ken as I called Kristy to look up my password. "Ok, but once you use that lifeline, you won't have it any more," Ken remarked. I smiled, envisioning a harried phone call placed to Kristy from the cockpit of the airplane while executing an approach. With IACRA presenting a bland, satisfied facade, we jumped into the hypothetical cross country flight that I had planned for Ken. As I researched the flight, I found that a preferred IFR route existed, though it contained an arrival procedure (STAR) at the destination involving a a minimum altitude of 11,000'. While possible to fly in my ship, this seemed like an unreasonable altitude for a Piper Warrior on a hot summer's day. Instead, I located a TEC (Terminal En Route Control) to my destination that made significantly more sense to fly. I suspected that a part of what Ken wanted to see was my recognition that these routes existed and some sound logic behind my ultimate selection. Ken and I talked through my choice of route and looked at weather data together. Was there a legal requirement that I file an alternate airport? No, the terminal forecasts were not sufficiently poor for that. But there were Sigmets for thunderstorms as well as thunderstorm warnings in the terminal area forecast at the time of arrival. Would I make the flight IFR? "No, the convective forecast is outside my comfort zone." Ken nodded and continued to use the scenario to further probe my book knowledge. Satisfied, he announced that it was time to fly. The thumping in my chest resumed. Darrell had already told me that I would like Ken, that he was reasonable and easy-going. Darrell was right; Ken was terrific, a seasoned aviator with a breadth of experience in professional and personal flying. So why did I feel like David Gilmour's "earthbound misfit" every time I opened my mouth? The simple answer is lack of sleep and inadequate confidence. Climbing away from Rochester while under the hood, I requested an ATC-assigned hold at the Geneseo VOR. I was assigned to hold southeast on Victor 147. After glancing at the en route chart and noting that this airway used Geneseo's 153° radial, I sketched the hold on my kneeboard and made the proper entry. At one point, Ken appeared to be concerned that I was leaning too much on the moving map of the Garmin 430W, so he "failed" it with Post-It notes. If anything, I tightened up my flying of the holding pattern. When Ken announced that we would do unusual attitude recoveries next, I knew that I had performed a satisfactory holding maneuver. We did two recoveries. For the first one, a descending spiral, my airspeed indicated well into the yellow arc and was climbing rapidly when I resumed control of the airplane. I was thankful to Ray for always reinforcing the notion of looking at the airspeed indicator first in those situations. The recoveries went well and Ken asked for a steep turn course reversal with a return to the hold. Next, we began a simulated VOR-A approach into Le Roy. While descending from the initial approach fix, Ken pointed to the vacuum gauge and asked what it would mean if the reading there suddenly went to zero. "I would lose my attitude and directional gyros," I answered. "Yup," he replied while covering those instruments with more of his ever-versatile Post-It notes. At this stage, my confidence was beginning to build and I nailed the approach, partial panel and all. Next, we flew the RNAV 25 approach into Rochester. Rochester vectored us onto the approach just outside of the final approach fix, TUNLE. I was told "VFR altitude [my] discretion" and cleared for the approach. I even demonstrated a function on the Garmin 430W that Ken, an experienced user of the device, did not know about. I crossed TUNLE at the appropriate altitude, reduced power, and flew the approach magnificently. One of my greatest fears prior to the check ride was inadvertently going below a minimum altitude, but the approach went quite well despite the gusty conditions. I was proud of it and my confidence continued to grow. Upon reaching the missed approach point, I added power and followed the missed approach instructions previously issued by Rochester. "I can't count that approach," Ken commented as we climbed away. This was code for "you just failed." My heart fell as I processed the implications. Rochester provided vectors around the south side of the airport to set us up for the third planned approach, an ILS onto runway 28, as Ken explained what I had done wrong. While Rochester was vectoring us to intercept the RNAV 25 approach just outside the final approach fix (FAF), I descended to the minimum crossing altitude altitude for the FAF before fully establishing myself on the approach. There was a logic behind what I did in the moment, but it was a false logic. In other words, I had a brain fart. Lack of rest and a bad case of nerves were likely contributing factors. On the bright side, it was a mistake that I will never make again. Ken had no choice but to fail me. After all, in actual instrument conditions, altitude is life. As I processed that I had just busted my check ride, I lost enough focus that my performance on the ILS 28 approach was unacceptably sloppy. Rochester Approach barked at me when my distraction resulted in missing an assigned heading. I do not have a track record of failure, particularly in aviation, and did not manage this bad news well. Somehow, I centered myself on the localizer at the decision altitude, pulled off the Foggles at Ken's prompting, and squeaked the airplane nicely onto runway 28. Ken explained the next steps. I would need to go back to Tom for additional training, receive a fresh sign off from him in my logbook to finish the check ride, and go on another date with the always-exciting IACRA system to generate a new application. Then, of course, I would need to take Ken back into the sky and demonstrate that I really did know what I was doing. The good news was that I would only need to fly those two approaches - I passed every other area of emphasis Ken threw at me and would not be retested on those items. We stood talking on the 300 ramp at Rochester while some magnificent thunderheads in the distance were highlighted in crimson by the setting sun. I took the menacingly lovely vista as a prompt to head home. I landed at Williamson-Sodus after sunset. I was frustrated with myself and discouraged. As I gloomily pushed the Warrior back into her hangar, my neighbor Bob wandered over to check on me. "You've been gone over seven hours! How did it go?" "I have to go back and redo part of it," I told him glumly. He made a face. "Oh...sorry to hear that." Sunset over Sodus and Little Sodus Bays. And, an hour afterward, night currency restored after a week's lapse. Eight thousand five hundred feet above seal level, Warrior 481 and I droned home above a bed of downy condensate, weaving languidly around the larger build ups. After many hours of instrument training, looking out the window again scratched a deeply held itch. 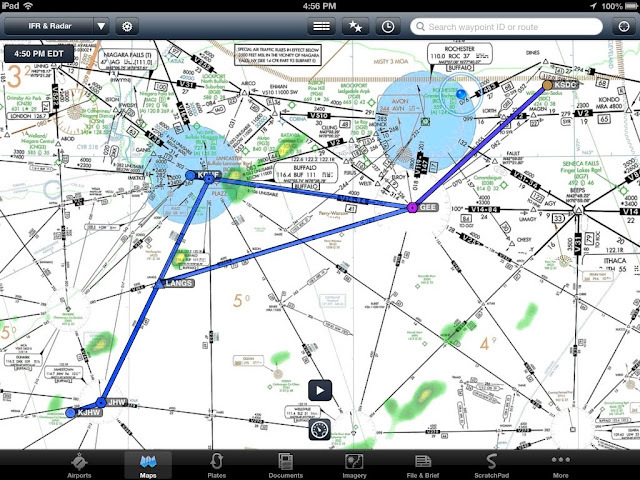 My iPad now routinely goes along for the ride, serving up aeronautical data via ForeFlight. In earlier posts, I reported a recurrent issue with the iPad overheating and protectively shutting itself down. I have since taken to placing the iPad on my left leg where it is less likely to experience direct sunlight. I have not had an issue since. The Stratus continues to work well, riding along in the middle of the back seat and drawing in ADS-B weather and GPS position data without any heat issues whatsoever. When I sold my beloved iFly 700 in lieu of the iPad / ForeFlight / Stratus combination, I had some initial remorse, but the set-up is serving me well. Now that ForeFlight has added "distance rings", a feature that the iFly incorporated that allowed for facile, at a glance, distance measurement, I no longer miss the iFly (though I wish that ForeFlight logged GPS tracks or that CloudAhoy would work with Stratus). From some distance out, it was obvious that some heavy cells were popping up around Rochester. I appreciated the early warning provided by ADS-B. Syracuse approach warned of isolated cells as well and, as I drew closer to home, my eyes confirmed the cells depicted by ForeFlight. Crossing south of Sodus Bay, the large cell parked offshore was visibly discharging electrical energy into the surface of Lake Ontario. Despite its proximity, there was no precipitation or wind gust near Williamson (though I did detect a shift in wind direction as I monitored the AWOS inbound) and I landed without issue. The large cell hovered just north of the Williamson-Sodus Airport as I tucked Warrior 481 back into her hangar. I realize that the ADS-B weather data provided by Stratus is delayed, a look at the recent past that should not be used in an attempt to thread between closely spaced cells. But one of the greatest causes of anxiety (at least, for me) while airborne comes from uncertainty of what lies ahead and the situational awareness afforded by ForeFlight and Stratus has been invaluable on my last few flights. The sense of community among aviators is an amazing thing. A love of airplanes and flight can create an instant bond between strangers, drawing them together to swap tales at any of the thousands of airports dotting the nation. It is a connection so strong that, within minutes of landing at a new-to-me airport, I can almost instantly engage in an enthusiastic conversation with complete strangers. This sense of community is one of my favorite aspects of flying. What newcomer would feel welcome by a sight like this? I appreciate that fences help keep deer off the airport and protect airplanes from the criminal element, but they are deleterious to public relations. Perhaps that is why, after her first trip to the airport with me, my mother remarked with surprise, "wow, airplane people are just like boat people!" This was my mother's way, in southeast Michigan vernacular, of saying, "wow, I had no idea that pilots were so open and friendly!" Boaters are notoriously friendly and it is not just because they get to drink beer while exercising their avocation (at least, I would like to think so). Pilots are very friendly too, once you get past the intimidating fence. Enter Amber Nolan, the self-styled "JetHiking Gypsy", a professional travel writer and non-aviator who had the audacity to challenge those fences with a big smile, a lot of enthusiasm, and an ambitious objective. Amber's goal is to "hitchhike" across all 50 states by general aviation while documenting her adventures. Along the way, she is learning that the pilot community is very welcoming of anyone interested in flying. As an "outsider", she is gaining unique insight into the aviation community. In my opinion, the JetHiking Gypsy has a unique podium to create bridges between the flying community and the general public through her tales of general aviation adventure and camaraderie. From a public relations perspective, I think her mission is a positive one for general aviation, an opportunity for non-flyers to understand what aviators and general aviation are really about. Arguably, taking to the sky with the Gypsy is a better excuse to fly than the average $100 hamburger run. When Ray from Le Roy told me that Amber was looking for a ride from Rochester, NY to Saratoga Springs, NY, I was more than willing to volunteer my time and ship for all the reasons cited above. And, selfishly, the destination was a new one for me and I was craving an excuse for a short excursion out of the immediate area. I emailed an offer to help that included a link to this blog and an open invitation to Internet-stalk me before accepting a ride. Suitably vetted as a volunteer pilot, the biggest challenge was waiting out the spate of IFR weather and thunderstorms that has dominated Rochester skies for the past two weeks. 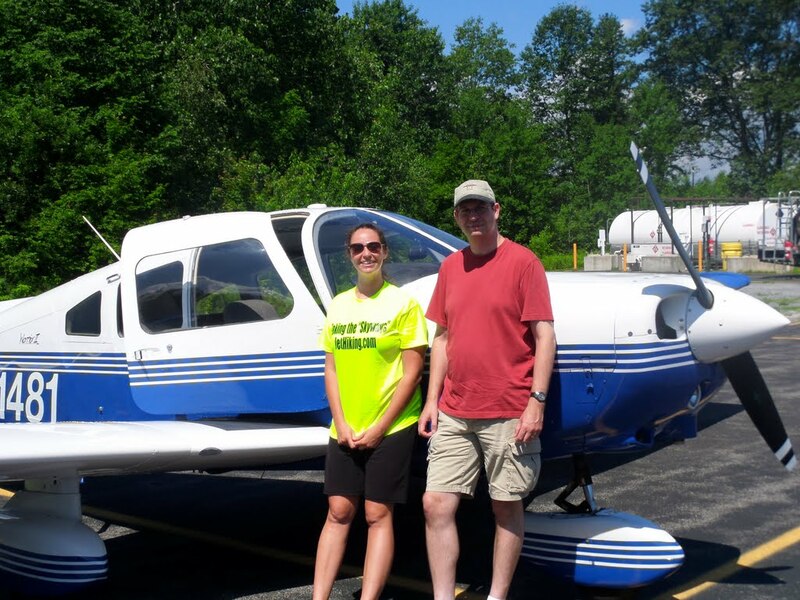 On the morning of July 5, we met at the Williamson-Sodus Airport for departure. Coincidentally, it was the very place where she experienced her first general aviation flight. In fact, Amber's entire cross country odyssey began from the Rochester airport in July of 2012. We did some aerial sightseeing over Chimney Bluffs before climbing over some scattered clouds for a direct flight to Saratoga Springs. Amber shared some of her stories of travelling the world as a writer and I shared some of my favorite flying destinations (we had Jekyll Island, GA in common). The time passed quickly and, before long, we dropped back down through a hole in the clouds and approached Saratoga County Airport. After so much focus on instrument training and flying in circles, it was a treat to fly someplace new outside of the immediate Rochester area. At Saratoga County, we met Mike, the pilot of a Cessna 180 who had previously offered to fly Amber across the state line into Vermont. Walking into the FBO, the Gypsy was greeted as a celebrity with a shout of "hey, it's the All Fifty States Girl!" While the line staff hung on her every word, I chatted a bit with Mike who had some interesting aviation experience beyond mine. It was a great morning of flying and aviation community. That afternoon, Amber reached state number twenty-nine by landing in Basin Harbor, VT. I have always tried to do my part for aviation PR by giving rides to anyone willing to entertain the idea. That is most definitely a one person at a time approach. Through her writing, Amber stands to reach a much broader cross section of the general public than I ever could. When she is done, I think she will have an amazing story to tell, one that will be good for general aviation. I wish her the very best of luck in her quest and am looking forward to reading all about it. Nearing the IFR check ride, a final hurdle remained in place: the dual (flown with an instructor) IFR cross country flight of 250+ nautical miles with different types of approaches flown at three airports. For me, the challenge of reaching this milestone lay neither in the planning nor the execution, but in finding an appropriate day to make the flight. To my mind, the ideal day would feature a thick stratus layer starting at 800 feet above ground level allowing for some actual IFR flight in a relatively benign atmosphere. In other words, the ideal weather would be crummy, but not too crummy; thunderstorms need not apply. Unfortunately, like much of the country east of the Mississippi, Rochester has suffered a soaking from an abysmal weather pattern generating a near continuous threat of thunderstorms. Our first scheduled attempt was Tuesday, June 25. I was worried about forecast thunderstorm activity, but we decided to re-assess closer to the planned departure time. I departed Williamson in Warrior 481 bound for Le Roy to meet Tom. On the way, I flew through a light rain shower that I first saw depicted on my moving map by Foreflight/Stratus before my eyeballs confirmed its presence. The let down into Le Roy was chock full of bumps and burbles, but this did not stand in the way of punctuality. I shut down at precisely the appointed 9:00 meeting time. Plan A: 279 nautical miles. My flight plan was meticulously crafted the previous Saturday while riding the train from Poughkeepsie to Grand Central in NYC. I was very proud of this plan, which had us flying from Le Roy to the Geneseo VOR, to Elmira for an ILS approach, to Jamestown via the Elmira and Wellsville VORs for an RNAV approach, then back to Geneseo via the LANGS intersection to fly the VOR-A back into Le Roy. Because it was our first time together in nearly three months, Tom and I did some review and went over the plan in detail. We briefed and filed it. Forecast convective activity along the route inspired a go/no-go debate. We hemmed, we hawed. When the office shuddered in a sudden squall, Tom and I ran outside and tied down Warrior 481. We sought inspiration from the local sky, despite knowing that the view would not be relevant to our planned route of flight. In the end, we came to a consensus that the risk of embedded thunderstorms was simply too high for comfort. My IFR flight plan expired without any clearance granted. It was a turbulent return to Williamson with a ground speed of 144 knots at 3000'. Had we gone, it would have been a rough ride and later viewing of the radar showed thunderstorm activity all along the planned route and, at times, right over the intended destinations. We made a good choice. A second attempt, Sunday June 30, was foiled by a broken ceiling of 600 feet over Williamson, preventing me from departing VFR to meet Tom at Le Roy. I noted with irony that it was exactly the sort of weather I had in mind for getting my IFR ticket in the first place. In lieu of flying, I washed and waxed the Warrior. It was exercise of a different sort. Forecasts improved for the evening of July 2 in that thunderstorms were absent from the terminal area forecasts, though there was still an active convective outlook advisory. Low weather was nonetheless anticipated across the route of flight. We concluded that it just might meet my idealized "crummy, but not too crummy" criterion. Moist air off of Lake Ontario was pushing south such that a 600' ceiling persisted over the shoreline and impacted the Williamson-Sodus airport. Tom, as keen to complete the cross country as I, offered to make the long drive from his house to Williamson. As I waited for him, I realized that my beloved original plan no longer made sense if we were flying from Williamson rather than Le Roy. I hastily crafted a new plan: Williamson to the Geneseo VOR, to Buffalo for an ILS approach, to Jamestown for a VOR approach, back to the Geneseo VOR via LANGS intersection, and an RNAV approach (LPV!) into Williamson. When Tom arrived, we reviewed the plan, briefed it with Flight Service, and filed it. Sitting in Warrior 481, the moment of truth came and I called clearance delivery on my cell phone. As the flight specialist put me on hold to contact Rochester Clearance, Tom looked me in the eye and warned, "if he comes back with anything other than 'cleared as filed', do not think - write." As it turned out, we were cleared as filed and received a release time ten minutes hence with a void time ten minutes after that. It was a perfect window with the airspace over Williamson owned by me for all of ten minutes. We departed Williamson in four miles of visibility and entered the cloud base at 400'. We contacted Rochester departure who responded with, "November 21481, radar contact, 1.5 miles south of the Williamson-Sodus airport. There are no other aircraft within twenty miles of you." I tuned the Geneseo VOR and intercepted the 060° radial while climbing to 4000'. At altitude, we were passing in and out of the clouds, but we were more in than out. Foreflight and Stratus showed some intense precipitation just to the left of our course and Rochester suggested a 20° course correction to the west. It was the first deviation of many. Rochester was juggling deviations for several commercial flights and one lone Warrior plowing through the cumulus. "The area around Geneseo is developing some very heavy precipitation," Rochester reported, then provided a vector that would avoid Geneseo. I set up the #1 Nav to intercept the next airway that would take us to Buffalo while Tom monitored our bearing from Geneseo on the #2. The world outside our windows varied from the absolute white of a blank canvas, to towering canyons of cotton candy, to neutral grey accompanied by streaks of moisture streaming over the windscreen. Through it all, my scan was solid and our heading and altitude remained true. I was amazed by my blase reaction to my first significant flight through real weather. On initial contact with Buffalo, the controller warned us that our planned sojourn to Jamestown might be unwise as thunderstorms were beginning to pop just south of the field. We decided to re-assess the situation after flying the ILS at Buffalo, but I began to seek an alternative to Jamestown that would provide a VOR approach that met the required diversity in approaches. Dunkirk had a VOR approach for runway 24 that looked like it would meet the need. I was thankful for Foreflight, which made this process comparatively easy to accomplish because of the way it organized and presented a voluminous amount of aeronautical data. Vectored onto the ILS by Buffalo, the cockpit of the airplane darkened as we descended deeper into the murk. I intercepted the glidslope, centered the needles, started the timer, and configured the airplane for a stable 500 foot/minute descent. Glancing outside, some fuzzy gray buildings could be just seen passing underneath, but no runway. Then, about two miles out, I got a visual on the runway. I returned my gaze to the instruments and flew the approach to the 200' decision altitude before breaking off on the missed approach. Climbing back into the clouds, Buffalo departure advised that Jamestown still looked like an undesirable destination, so we amended our clearance to Dunkirk. As luck would have it, a direct run to Dunkirk from Buffalo put us right down the throat of the approach. My approach there was a bit sloppy because I had not briefed that particular plate until we were en route, but it was passable. After the low approach, I was preparing to enter the published hold when Buffalo cleared us direct to Williamson-Sodus. "You do not want to go near Geneseo right now," the controller informed us as he eschewed the last vestiges of my original flight plan. We enjoyed several minutes of clear air over a fluffy undercast while surrounded by cumulus gorgeously accented in golden highlights by the setting sun. Through it all, the Buffalo and Rochester controllers took excellent care of us as we worked as full partners in finding suitable deviations to get us home. Having the ADS-B weather displayed on Foreflight, even knowing that it was less current than what the controllers saw on their screens, provided an excellent visual representation of the very detailed reports of heavy precipitation given to us over the radio. I was glad to have it. During the relatively calm flight back to Williamson from Dunkirk, Tom said, "you couldn't have asked for a better training experience than this." Indeed. It was no sterile, canned training experience, but an immersive lesson on managing real world weather deviations. I was reminded of a recent, excellent post by Frank Van Haste on this very topic. Unlike my prior actual instrument time in which we chose higher altitudes that deliberately put us in the clouds, this flight could not have been conducted any other way but IFR. And, it met the "crummy, but not too crummy" goal - even if conditions were actually crummier than we anticipated. At least the thunderstorms were in isolated pockets amenable to circumnavigation. We never experienced any significant rough air, which suggests that we never came particularly close to the convective activity dotting the airspace around us. Closer to Rochester, more isolated buildups necessitated a deviation well north of the city toward Lake Ontario. Briefly, I saw the Port of Rochester pass below through a hole in the clouds. In the post-sunset gloom, we literally swam through a grey murk with water flowing over Warrior 481's recently waxed skin. Williamson was still IFR, though the ceiling was higher than when we departed. The GPS-generated glideslope led us down through the grey until we broke out from the cloud base to see the runway lighting shining merrily from a dusky landscape as rain pelted the windscreen. The landing was no greaser, but a solid, good landing that inspired Tom to quip, "and after all that, you just had to show off!" Once the Warrior was put to bed for the night, Tom and I were walking back to the clubhouse in the light rain when he gave me a shove. "You did frikkin' awesome tonight!" I count that as one of the best compliments on my flying that I have ever received. We logged 3.0 hours total with 2.6 in actual IFR conditions. When I asked Tom what we needed to do next, his response was that I needed to take my check ride. Over breakfast with my daughter the following morning, I asked, "do you know what I did last night, Little Bear?" "I flew inside the clouds." Her eyes grew large and she gaped for a moment. "Wow! Will you take me into the clouds with you?"